The highest profile round of the day is not happening on the European Tour nor the PGA Tour. It’s happening at Trump National Jupiter, where President Trump is playing with Tiger Woods and Jack Nicklaus. Trump’s Jupiter course butts up next to Nicklaus’s “The Bear’s Club” — in fact, the two private clubs share the same driveway — so to see the two playing together is not wholly surprising. Woods is a Jupiter resident and has also played rounds with Trump in the past. Nicklaus and Woods are the two most prolific players in golf's modern era, and have won 18 and 14 major championships, respectively. The two legendary pro golfers have reportedly not played golf together in nearly 20 years. The President tweeted out a photo of the group Saturday afternoon. Playing along with that trio was Nicklaus's son, Steve. 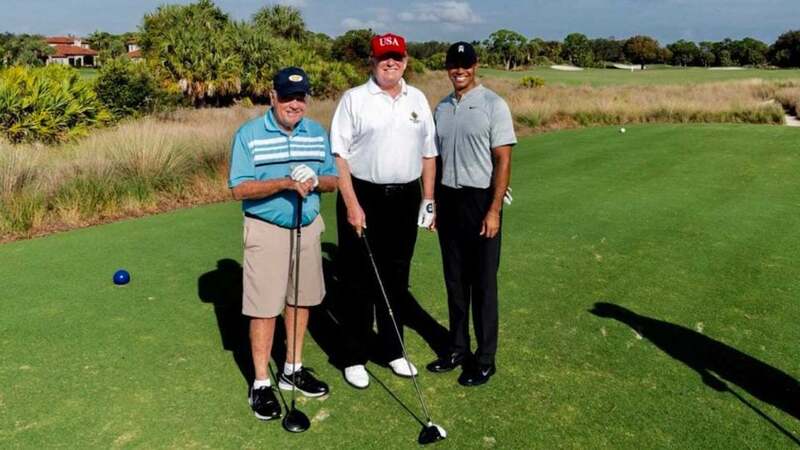 Photos of the three on a putting green have made their way to social media, as well as videos of Woods hitting driver alongside Trump’s golf bag, Trump talking with Nicklaus and Trump hitting some irons on the range. The only questions that remain right now is who was the fourth, and what game are they playing?